I bet you’ve heard about the dominant 7th chord. The sound of this 7th chord gives a bluesy and complex feel to your playing and it’s used in the blues all the time. I will show you a little trick to bring more brighter feel to a barre shape of this 7th chord. Barre chords have the property to move up and down the neck of the guitar. They are moveable without having to change the chord shape. There are a lot of different ways to play these barre chords. 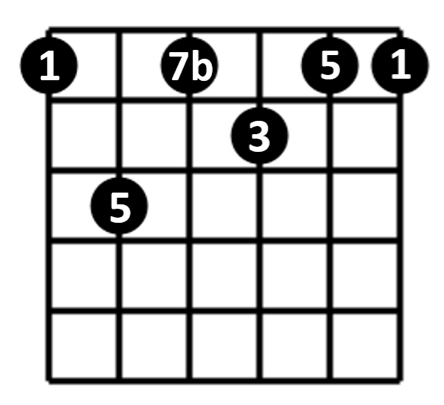 Let’ take a look at the shape of the dominant 7th chord shown in the diagram below. This shape of the 7th chord is moveable and the note on the low E string defines the chord we are playing. So for example, playing this chord with your index finger on the 5th fret will give a dominant A7 chord. Move the shape up a whole step so it’s positioned at the 7th fret and you’re playing a B7 chord. The notes that construct the chord are related to the mixolydian mode. A seventh chord is composed out of 4 notes, were the chord formula goes like this: 1 – 3 – 5 – 7b. These numbers are the note numbers of the mixolydian mode. Let’s explain this with an example. The table below shows the notes of the A mixolydian mode. Apply the chord formula of the 7th chord and you’ll end up with the notes shown in the table below. These notes construct the dominant 7th chord. Now that we know what notes the dominant 7th chords are constructed with, the magic is about to happen. When the barre chord is played, your pinkie is still unused and it’s free in the air. The pinkie is now the perfect player to bring the feel of the chord to whole new level. On the B string, not so far from the barre chord, there is a note that’s part of the 7th chord which can be used in the chord shape. It’s the 7b from the chord formula. Because the pinkie is still unused we let this finger contribute in the chord shape to play this extra note. When you play this new shape it will give a slight minor touch to the sound of the 7th chord. This can be explained by the fact that there is a minor 7th note added to the shape. Instead of one minor 7th we have two of these notes contributing in the chord shape. The minor feel of the minor 7th will now have a bigger impact on the final sound of the chord, which makes the chord sound brighter. Letting your pinkie play along to construct this little variation gives an opportunity to bring more bright sounds in your blues playing. Playing the chord in the right context will give such a big impact on your audience. Antony Reynaert is a guitar coach from Belgium who instruct blues lessons online and locally. Through his website Best Blues Guitar Lessons he offers many videos and articles about blues lead and rhythm guitar.